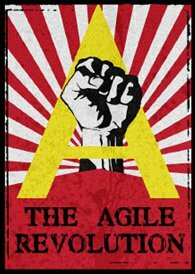 Joint podcast with “This Agile Life” – our second favourite Agile podcast! 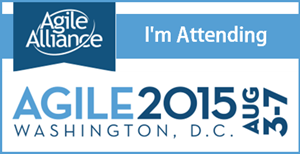 Craig and Renee are at Agile 2015 in Washington, DC and in the open jam area team up with Jason Tice and Natalie Simonsen from the “This Agile Life” podcast for a crossover episode. Joining in the roundtable conversation are Stephen Vance, Troy Tuttle, Jenny Tarwater, Abby Bangser and Serge Beaumont. 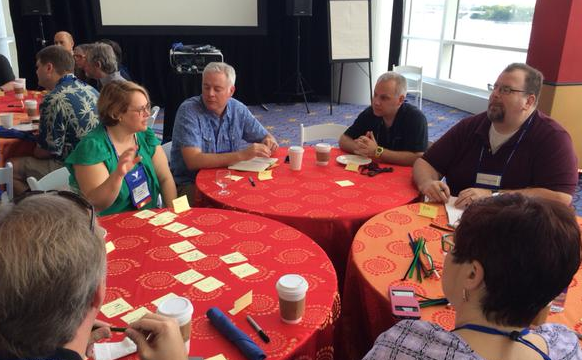 Abby Bangser and Jason Tice continue a discussion from Lean Coffee at Agile 2015 regarding the benefits of having a full lifecycle Kanban board (product envisioning thru development thru formal testing and acceptance by the customer). Jason Tice proposes an experiment (to the organizers of Agile 2016 – Bob Sarni) whereby there would be a video interview with presentation submitters prior to acceptance to confirm that their presentation is focused around learning vs. a sales pitch for a product and/or training. BTW, the conference chair of Agile2016 is Bob Sarni – Jason mis-spoke in the recording regarding Bob Payne – there just happen to be quite a few Bob’s involved in the planning of agile conferences. Serge Beaumont mentions a few of the activities that provide value in addition to the conference sessions, such as the Scrum Alliance Coaches clinic and Open Jam. He suggests that the conference conclude with some type of “Open Space” in future years.